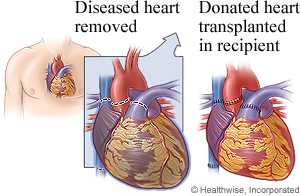 A heart transplant is a procedure in which a surgeon removes a diseased heart and replaces it with a donor heart. The doctor will make a cut (incision) in the skin over your breastbone (sternum). Then he or she will cut through your sternum to reach your heart. During the surgery, a mechanical pump circulates blood through the body while the doctor removes the diseased heart and replaces it with a healthy heart from someone who has died. The doctor will use wire to put your sternum back together and will use stitches or staples to close the incisions in the skin over your sternum. The wire will stay in your chest. The incisions will leave scars that may become less noticeable with time. You will spend about 1 to 2 weeks in the hospital after surgery. You may have to stay longer depending on your health and if you have problems from surgery. You probably will feel better each day, but it may take several months to get your energy back. Stay as healthy as possible by eating a healthy diet and being as active as you can. You will be kept comfortable and safe by your anesthesia provider. You will be asleep during the surgery. The surgery will take at least 4 hours. You will have chest tubes to drain fluid and blood after surgery. The fluid and extra blood are normal and usually last only a few days. The chest tubes are usually removed in 1 or 2 days. You will likely start a cardiac rehabilitation (rehab) program in the hospital. You will continue with this rehab program after you go home to help you recover and prevent problems with your heart. Enter F172 in the search box to learn more about "Heart Transplant: Before Your Surgery".